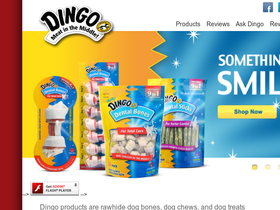 Dingo, online at dingobrand.com, is the delicious destination for doggy treats and rawhides. Dingo offers tasty dog treats made with real meat in the middle to enhance flavor and keep dogs happy. Dingo offers dental treats for oral care, rawhide chips, real meat chews, rawhide sticks, natural rawhide bones, and more. Dingo also offers discounts and deals on their great selection. So give your dog something special from Dingo. Check out RetailSteal.com for the latest Dingo discounts, Dingo promotions, and Dingo coupon codes. Dingo offers shipping promos that change often. Stop by RetailSteal.com for the latest Dingo shipping special offers. Dingo offers standard and express shipping options, and ships within the United States. Save 25% on your entire order at Dingo using this coupon code. Click to shop. Shop at Dingo and enjoy free shipping on any purchase $50+. Use code and enjoy a $25 discount on your Dingo order $100+. Save $10 at Dingo. Use coupon code on orders $40+. Save up to 40% on dog treats special offers at Dingo. Click link for tasty savings.